Rooms from $197.10 per night. Description This Saint Simons Island, Georgia resort has an outdoor pool, free internet access and non-smoking guest rooms. This hotel is also pet friendly. Offering an outdoor pool this Saint Simons Island inn also features an on-site bar. Free WiFi small refrigerator and flat-screen cable TV are featured in every coastal-inspired room at this Georgia Inn at Sea Island.Sports activities and 9 restaurants are off site at Sea Island's The Cloister and The Lodge for an additional fee. Access to the Cloister Beach Club with 3 outdoor pools a water slide and 8 km of private beach is offered for a fee.Three championship-calibre golf courses and Professional Golfers' Association-certified (PGA) instructors are available. A fitness centre tennis court and water sports equipment are offered off site at The Cloister.A wardrobe seating area and sofa are standard in all rooms. Extras include a desk full-length mirror and an en suite with a bath or shower.The property is 6 minutes' walk from Island Cinemas and 4 minutes' drive from the beach. Fort Federica National Monument is 5.7 km away. 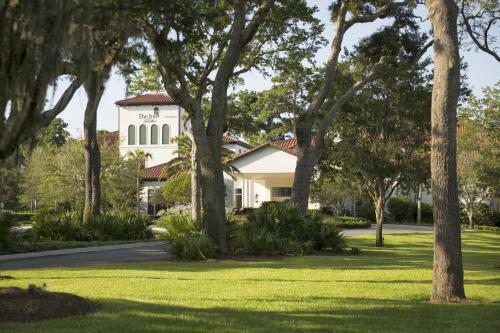 Add The Inn At Sea Island to your free online travel itinerary.